Today, the Franklin Founding Father Commemorative Silver Dollar Coin remembers the colonial convention, beginning June 19, 1754, where Franklin proposed his Plan of Union. In 1754, the tokens of another war with France began to be visible; and as the colonies would not only be involved in it, as a matter of course, but were likely to become one of its principal theatres, the British government directed a convention of colonial deputies to be held at Albany, for the purpose of meeting the chiefs of the Indian tribes known as the Six Nations, to concert measures for the common defense, and to secure, if not the active aid of the tribes, at least their friendship and neutrality. The order for this convention issued from the English board of trade; and Governor Hamilton, on communicating it to the Pennsylvania Assembly, together with a recommendation that means should be supplied for making suitable presents to the Indians, nominated Franklin and the speaker of the Assembly, Isaac Norris, to act with John Penn and the provincial secretary, Richard Peters, as the deputies of Pennsylvania to the proposed convention. The Assembly promptly assented to the nominations, and voted the presents. The meeting took place at Albany, on the 19th of June, 1754, and consisted of delegates from New Hampshire, Massachusetts, Rhode Island, Connecticut, New York, Pennsylvania, and Maryland. Franklin had meditated much on the expediency of forming a union of the colonies for certain general purposes; and on his way to Albany he sketched a plan of such union, which, while in the city of New York, he submitted to some of the leading men there, whose approbation of its general scope and propositions was so marked, that he laid it before the convention. Though none of the delegates, except those of Massachusetts, had been instructed to undertake anything more than to secure the friendship of the Six Nations, and provide for resisting the inroads of the French and such tribes as might join them, yet the advantages of a closer connection between the colonies had been more or less considered in various quarters; and the delegates of Massachusetts had been expressly empowered to enter into a closer confederacy for general defense and for promoting the common interests of the colonies, in both peace and war. This important question being brought before the convention, that body, on the 24th of June, after voting unanimously that a union of the colonies was “necessary for their security and defense,” appointed a committee to consider and report to the convention a plan for such union. This committee consisted of Thomas Hutchinson, of Massachusetts; Theodore Atkinson, of New Hampshire; William Pitkin, of Connecticut; Stephen Hopkins, of Rhode Island; William Smith, of New York; Benjamin Franklin, of Pennsylvania; and Benjamin Tasker, of Maryland. After deliberating on several schemes of union presented, the committee agreed upon Franklin’s, and on the 28th of June reported it to the convention, where, after being debated for twelve successive days, it was adopted without opposition on the 11th of July, and on the same day the convention broke up. The plan thus approved provided for the appointment, by the king, of a president-general; and for the election, by the respective colonial Assemblies, of a fairly-apportioned legislative body, to be called the grand council, to meet statedly once a year, and oftener if necessary, but whose enactments were to be subject to the assent of the president-general. When thus passed, they were then to be submitted for final approval to the king in council, and were to take effect as soon as approved, or, if not disapproved, at the end of three years. The powers of the government thus organized included the making of all treaties with the Indians for the purchase of their lands, the regulation of the Indian trade, and making war and peace with any of the tribes; the formation of new settlements, and the support, defense, and government thereof, until the king should form them into distinct colonies with separate charters; and the raising, organization, equipment, and pay, of all military forces in the colonies, by land and water, for the common defense, and for the protection of the coasting and frontier trade. To defray the expenses of this general government, power was given to lay and collect import duties and internal taxes, and to appoint a treasurer-general, as well as a special treasurer in each colony, if deemed expedient; the moneys thus raised to be deposited in the respective colonial treasuries, subject only to the orders of the general government; and no payment to be made on account of that government, but on the joint drafts of both branches, or in pursuance of special provision in any act of appropriation. All commissioned military officers, for service on land or water, were to be nominated by the president-general and approved by the grand council; and all civil officers to be nominated by the latter and approved by the former. The existing civil and military establishments of the respective colonies were to remain unaltered; and in any sudden exigency, each colony might forthwith defend itself without waiting for the action of the general government; but all just and proper charges thus incurred were to be reimbursed from the general treasury. Other pro visions were made for carrying the above powers into effect; and the plan was to be submitted to the several colonial Assemblies for their adoption, and then to be finally ratified by an act of parliament. Such were the outlines of the Plan of Union of 1754, the distinctive features of which were derived from Franklin; and they bore a much nearer resemblance to the present constitution of the United States, than the Articles of Confederation framed by the Continental Congress in 1777. In that particular most essential of all to its own efficiency, namely, its direct action on the people in laying and collecting the taxes and duties necessary to the accomplishment of its objects, it proceeded on the same principle as the present constitution: whereas, the Confederation of 1777 depended on thirteen separate governments for the quotas of revenue necessary to maintain the federal authority, which, as soon as the external pressure of war was removed, was, through that dependence, found too weak to sustain itself. Even during the war, the chief difficulties arose from that same source; and it was the common feeling of danger, together with the patriotic spirit of the times, far more than any real vigor in the government, that enabled the assertors of American independence to achieve their purposes. But the people of the colonies in 1754 were not yet ripe for so efficient a scheme of government, or so close a union. They needed not only some twenty years’ more experience of the evils of dependence on a foreign power, to prepare them fully for independence, but, in addition thereto, the still further experience of the weakness and perils of a loose and inefficient confederation of states, to prepare them for actual union and a real government, endowed with sufficient powers either to insure internal order and tranquility, or to provide for their common defense against external aggression, or enable them to develop, in peace and security, the resources of the country. The result was that the plan, upon being submitted to the several colonial Assemblies, was rejected, chiefly on the alleged grounds that it conceded too much to the royal prerogative, and would endanger the liberties of the colonies; while the British board of trade, the channel through which it was to be presented to the king in council, were so jealous of its republican principles, and of the powers it conferred upon the colonies, that they did not even lay it before his majesty. The Assembly, however, through the management of a member, whose name is not given, but who was no friend to Franklin, very unfairly took up the plan in the absence of the latter, and rejected it without examination. In referring to this matter long after, Franklin himself remarks that the opposite reasons for rejecting his plan of union led him to consider it as having hit just about the true medium. And as nobody at that time entertained any design of separation, but simply and in promoting their best interests, in connection with those of the mother-country, he always adhered to the opinion that it would have proved happy for both parties if his plan had been adopted; for by such a union, the colonies being enabled to defend themselves, no troops from England would have been needed, and the pretext for taxing the colonies by act of parliament, with its consequences would have been avoided. 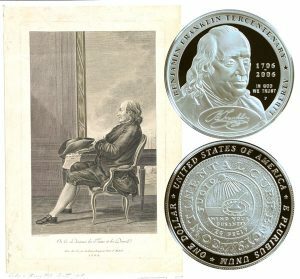 The Franklin Founding Father Commemorative Silver Dollar Coin shows with an artist’s image of Franklin, circa early 1780s.